Below is an excerpt from Cortical Visual Impairment: An Approach to Assessment and Intervention(Second Edition), by Christine Roman-Lantzy. * This publication is available through AFB Press (http://www.afb.org/info/publications/afb-press/12). APH is in the process of assuming stewardship of AFB Press. This title and others will soon be available in the APH Store. The suggestions presented here provide methods for including two-dimensional materials in the learning routines of students who have CVI. 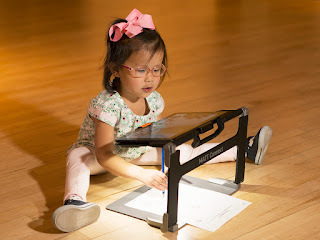 It is important to remember that two-dimensional materials are generally used with students who score above 6 on the CVI Range, unless the two-dimensional image is presented using a backlit system such as a tablet. Moving from three-dimensional objects, such as Slinkies, pom-poms, and balls, to two-dimensional pictures requires careful planning, so that students will be challenged at, but not beyond, their assessed level of CVI. The suggestions that follow provide a framework for this progression. They primarily address issues related to the CVI characteristic of difficulty with complexity, but they are also helpful when dealing with other characteristics, including color preference and difficulty with the visual novelty. · Simple, translucent colored pictures, such as the Familiar Objects Pictures (available from the American Printing House for the Blind; see the Resources section in the online AFB Learning Center), presented on a light box can teach picture discrimination, picture recognition, and picture identification. · Symbols used for communication or to help students anticipate daily routines can be adapted to make them more easily viewable by children with CVI, by selecting them for such features as preferred colors, familiar items, low levels of complexity, movement and so forth. · Simple picture books can be created with only one picture per double-page spread. Images should be selected based on color preference, familiarity of subject, and simplicity. · Books that have pictures based on a theme – for example, “foods I eat,” “things I wear,” or “toys I like” – can be created or selected from books that are commercially available. Only outlined drawings should be used initially – avoid pictures with internal details as well as photographs until the student is well into Phase III (7+ to 10 on the CVI Range). · Commercially available books that are very simple can be selected for use with a child based on color preference and the child’s interest. · When photographs are presented, begin with faces, and only later present pictures of familiar people against neutral or plain backgrounds. · Additional photo books can be designated around particular themes of interest, for example, photos of balls or animals. · Keep in mind that recognition of oneself in photographs generally occurs around the same time that an individual is able to recognize him- or herself in a mirror image (generally after scoring 7 to 8 on the CVI Range). *Reproduced with permission of the American Foundation for the Blind.